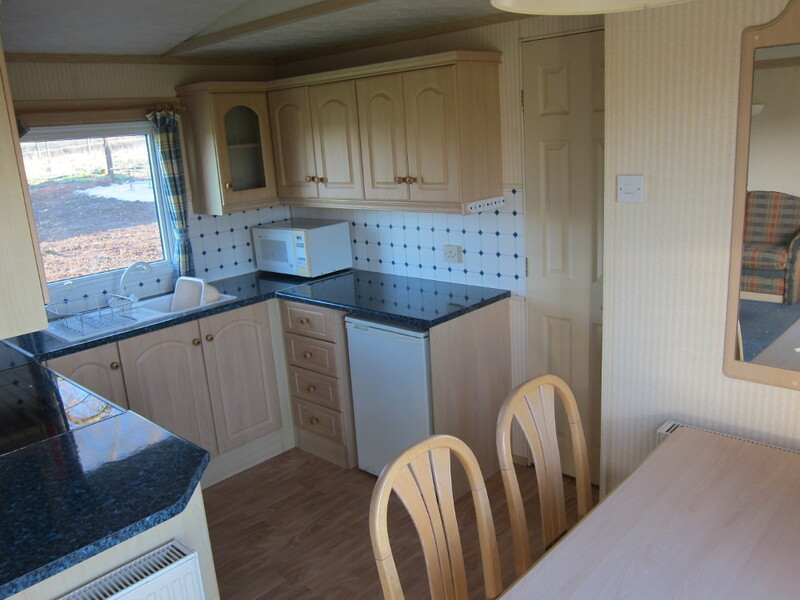 The static caravan has served me well for very nearly 3 years but now I have no further use for it and it’s time to find it a new home. It would be ideal for someone starting a similar self-build project – the double-glazing and central-heating mean it’s suitable for year-round use. Currently located in Chellaston, Derby. If anyone is interested leave me a comment and I will provide more details and / or arrange a viewing. Security: Before the old farmhouse was demolished it received some unwelcome attention because of its relatively isolated location. Having a visible presence on-site outside working hours should deter the Bad People from taking too much of an interest while the house is being built. Monitoring the Build: Being at the site every day will make it easy for me to keep an eye on the progress of the construction and hopefully spot any issues before it becomes too difficult to correct them. Cost: Renting a small house in the area would cost around £600 a month. Over 18 months that’s more than £10,000 and for that money you can buy a perfectly respectable second-hand static caravan. Learning more about the Site: By living on-site you get a much better sense of how the weather affects the site, where the noise comes from etc. I don’t expect to change the basic layout of the buildings but the landscape design can be refined with a better understanding of how the site works. Living in a static caravan on-site seems a fairly common thing for a self-builder to do and there are always one or two caravan companies exhibiting at the big home building shows. One company, Midland Caravans, is based just 10 miles from the site and I found they had a good selection of stock at the right sort of prices. I agreed to buy one of their caravans back in January, just before the sale of my house fell through, and they kept it for me while the sale of the house was re-arranged. 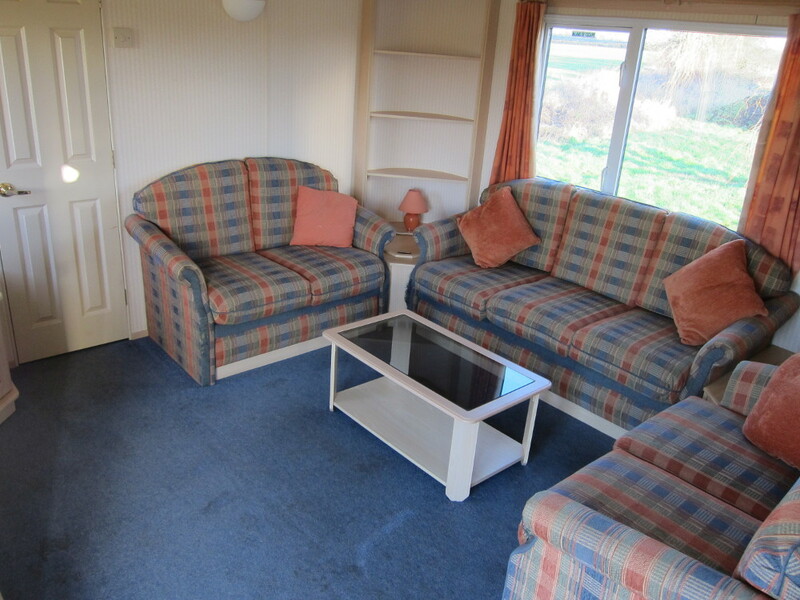 The caravan is a Willerby Villa dating from 2001. 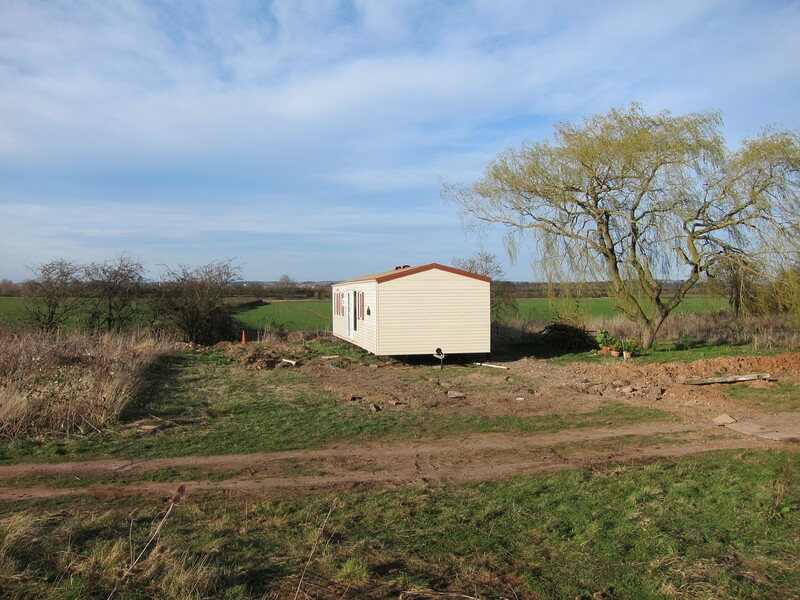 37′ (11.25m) long and 12′ (3.65m) wide with a centre lounge, two bedrooms, two bathrooms, a (plastic coated steel) “tiled” pitched roof, double glazing and central heating. What I realised while viewing various different makes and models is that most of them have a flat inner ceiling even when they have a pitched outer roof. That’s not the case with the Villa and the living / dining / kitchen area has a ceiling that follows the roof line, which gives a much greater feeling of space, especially if you’re as tall as I am. 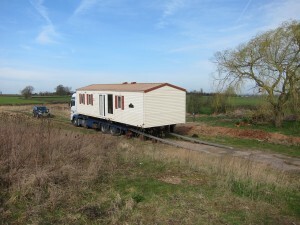 I didn’t want to leave the caravan unoccupied on-site for too long so I arranged for it to be delivered just a couple of days before moving out of my old house. When mounted on the back of the lorry the roof of the caravan is really rather high off the ground which caused the delivery team some concerns about whether it would fit under the overhanging trees in the lane leading to the site. In the end they decided it would be better to come in from the Aston-on-Trent end of the lane and then reverse down the access track, which worked out OK – it was a bit of a tight squeeze in places but the guys do this all the time. 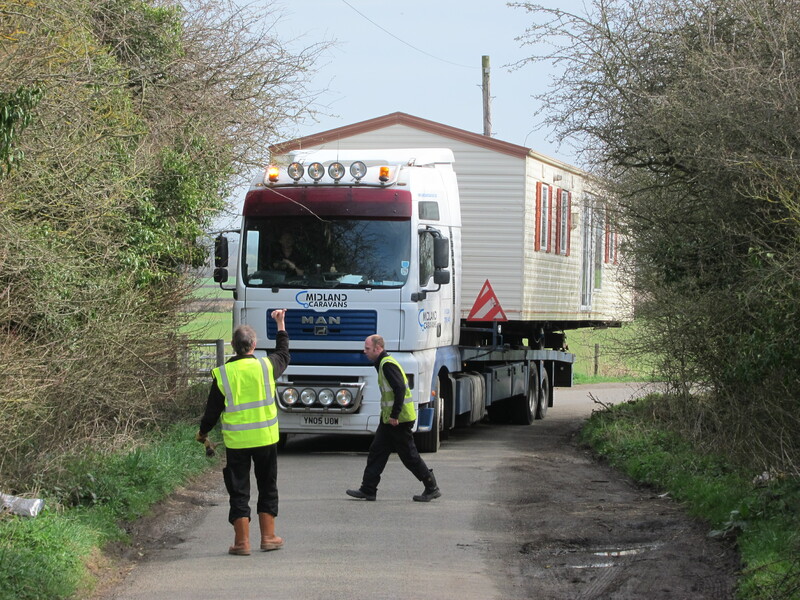 The delivery lorry has air suspension which means it can be raised and lowered so that the 12′ caravan was able to pass over the 12′ gate posts whereas it would not have fitted between them. 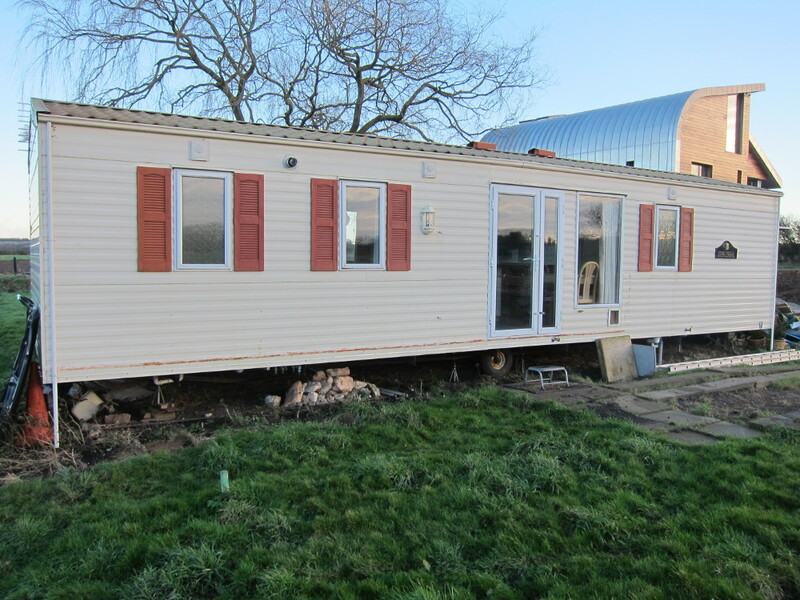 I wanted the static caravan to be well clear of the demolition and building works so it needed to end up about half-way down the site, facing the access track, next to where I had installed the electricity and water supplies. After unloading from the delivery lorry the caravan needed to be moved into its final position. Although the ground had dried out significantly following the heavy rain in previous weeks it was still a little soft, especially below the surface layer. The total weight of the caravan and all its fixtures and fittings – something like 4 tonnes in total – is resting on 2 wheels so there’s a significant load on each wheel. That caused some problems and the wheels kept sinking into the ground, especially where the trenches had been dug and refilled for the water and electricity services. The delivery team persevered, jacking the caravan up repeatedly and filling the holes under the wheels so that by the end of the afternoon it was finally in the right position. The biggest annoyance for me was that one of the drain valves for the central heating pipes was in an “accessible” (also known as “exposed”) location under the caravan and the plastic pipe fitting got broken so the central heating system that had been carefully filled with antifreeze and corrosion inhibitor drained out and couldn’t be used until the pipework was repaired and the system refilled. It was very clear that had the ground been even a little wetter it would have been impossible to position the caravan without having laid some hard-standing for both the final location and the route from the unloading point, so from that point of view it was just as well the delivery got delayed until March. Since the caravan is only a temporary feature I really didn’t want to have to build a big concrete pad to put it on.